I love independent reading (or student-selected reading), and I love talking about books! It only makes good sense to me, then, to allow my students to show their growth in independent reading through book conferences. Book conferences are an informal conversation between the teacher and student to show completion of and reflection on a novel. I learned a lot from my first entire school year of doing book conferences last year. 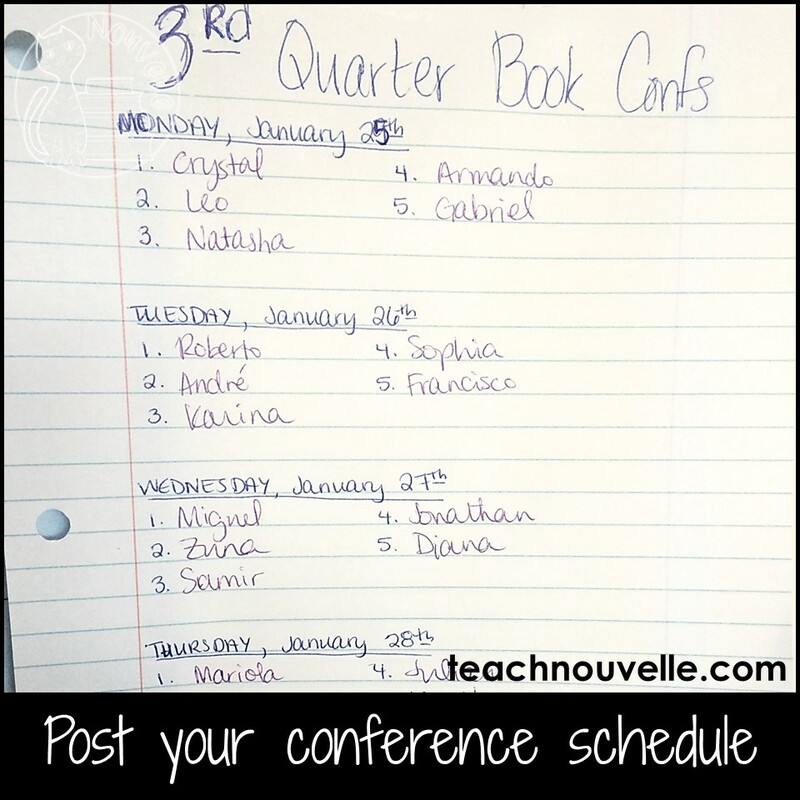 The first quarter, I allowed students free reign on when they came to me for a conference. It was a disaster! Basically everyone waited until the last day, and everyone kept accosting me before school, during lunch, and after school. If I had given up, I would never have learned the joy of book conferences. By the second quarter, I decided to have a schedule. I scheduled students across 2-3 days towards the end of the quarter where the rest did independent work and I held conferences at my desk. Students drew time slots from a hat at the beginning of the quarter, and I had the list of conference dates posted for the entire quarter for them to reference. Hint: You can offer extra credit for anyone who completes a book conference early. This will alleviate your conference fatigue during the three days. Know what you’re going to ask. Tell me about your book. – Encourage your students to summarize. Teach them how to talk about a book without being specific about characters and small plot points. “Somebody wanted _____, but then…” is a great tool for book conferences. Why did you decide to read this book? (Did someone recommend this book to you? Did you like the cover?) – This can be a great question for establishing what your students’ attitudes are towards independent reading. Do they have reading mentors in their lives? Do they read the backs of books to determine interest? Are they drawn to covers? Do they know how to search on Goodreads and Amazon for recommendations? What was your favorite moment in the book? – Already, you’re getting to the joy of conversation. You’re reminding students to read for joy, as opposed to reading for minutia. You can also discover a lot about students’ interests by the scenes that impact them. Other joy-based questions: Who was your favorite character? What did you think of the setting? What was the most exciting challenge the protagonist faced? Who would you recommend this book to, and why? – This is a question that asks students to assess the worth of the book in social terms. Students may say “People who like…” and name other books and movies. This is okay, but encourage them to name actual students in their class. This helps build your community of readers. -Have you seen the movie?/Will you see the movie now? -Will you read the sequel? What do you hope happens in the sequel? -Have you read (name of another book) by this author? How do you think the stories compare? Give them something to take away with them. This is my favorite part of book conferences. This is the part where you get to build your relationship as readers and consumers of media. You are going to send them off with at least one recommendation for something to read, watch, or listen to next. I keep Post-it notes at hand during book conferences for this purpose, along with a running list next to my desk of recommendations that I think of for various students. Here’s an example. Say you have a student who enjoyed the dystopian aspect of Matched by Ally Condie, but said that the action was a little slow or commented that it had too much romance. You could easily recommend Divergent by Veronica Roth. On the flip side, if a student loved Matched, you may want to point out that there are two sequels (Crossed and Reached). You can also recommend Delirium by Lauren Oliver. If you have a student who read and enjoyed The Fixer by Jennifer Lynn Barnes, you can tell the student that they might enjoy watching Veronica Mars. If you have a student who isn’t sure what to read, but likes watching the BBC’s Sherlock, they may enjoy the Stoker-Holmes novels by Colleen Gleason. Likewise, accept recommendations from students. If a book your students read sparks your interest, PLEASE tell them so! There is nothing more validating to a young reader than an older person valuing their opinion and actually reading a book they’ve recommended. Your students may even lend you books. I’ve read some of my favorite books on the recommendations of my students, including Andy Weir’s The Martian and Kiera Cass’ The Selection. Ah, yes. Grading independent reading. You certainly have a choice in how to do this, and I’ll let you know what I do. You can choose to set up an expectation of a page number per quarter with your students and simply grade them on the percentage of that page number they complete. You could also grade them on their speaking skills during the book conferences. I do assign a reading target each quarter, and I have it in page numbers. However, I do not grade by number of pages. I prefer to keep emphasizing the joy of reading, and grade this assignment very generously. If a student has chosen a book that is appropriate to their reading level and actually read the book and talked about the book well, I’m fine with giving them a hundred. I’m not going to split hairs over 5-10 pages of distinction between one book and another. I want them to choose books they’re going to love. That’s how I do book conferences in my classroom. What about you? What have you tried that’s worked? What questions do you still have? Let me know in comments.